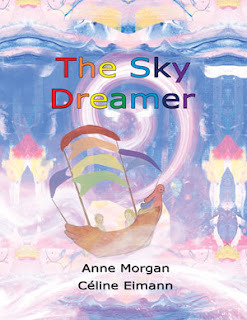 The Sky Dreamer is a touching children’s picture book written by Anne Morgan and illustrated by Celine Eimann. It was published by IP Kidz in 2011. When Liam’s sister dies, his world turns grey. He spends hours watching clouds crossing the wintry skies, hoping that Cassie is out there somewhere. The night before Liam’s birthday, Cassie sails the Sky Dreamer to their home and invites Liam to climb aboard. Together they sail through the sky while Cassie sews Liam’s birthday present. But just like in real life - it’s not always smooth sailing. Along the way there are thunderclouds, lightning, and a storm of meteorites. "Help me, please!" Liam begs. But Cassie keeps sewing. Cassie is only there to guide him, it’s up to Liam to steer himself out of the grim, grey fog and take control of his life. The Sky Dreamer is one those books where the author and illustrator have done an extraordinary job approaching a difficult subject like death. Even though it is ultimately about the death, I believe it encourages children to explore their emotions in many situations where they may be grieving or need to be strong and independent when they’d rather run and hide. Eimann’s whimsical illustrations are a mixture of soft pencil and swirls of pastel paint. The pages start completely grey and grow to splashes of dreamy colour. At the end, Cassie leaves Liam with a precious rainbow cloak that she has sewn to keep him warm, safe, and to brighten his life. The Sky Dreamer is a comforting children’s picture book that allows children to recognise their emotions and take control of their life after the death of a loved one, just as Liam has done. Renee Taprell is an Early Childhood Teacher and aspiring children's author. Her blog, Books for Little Hands, focuses on picture books and writing for young children.